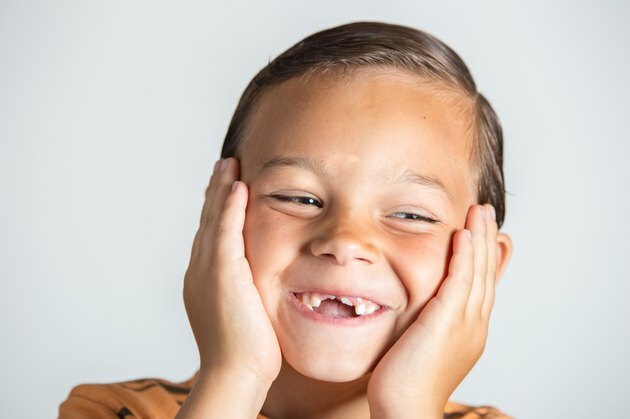 The American Dental Association says a child's baby teeth are as important as permanent teeth because they aid in a child's speech development and set the foundation for permanent teeth. Therefore, your fears may be justified when you notice your child's teeth are discolored, translucent, chipped or showing other signs of weakness. However, many signs of weak teeth may be the result of your child's behavior and not a sign of poor health. Baby teeth can be considered "weak" in a multitude of ways. Teeth may appear brown, gray, speckled or even translucent. Alternatively, teeth may be prematurely loose or chip easily. Your child's teeth may also be prone to decay, making for many distressing trips to the dentist. Some dental disorders may also cause your child pain, resulting in a lot of tear-filled nights. Many times, weak baby teeth are the result of a disorder. For instance, the genetic disorder dentinogenesis imperfecta is found in as many as one in every 6,000 people, according to Genetics Home Reference. This disorder causes a discoloration of the baby teeth and results in abnormally weak teeth. Other disorders may also cause tooth weakening and are more difficult to recognize. A dentist will know the best course of action for these disorders. While genetic disorders account for some causes of weak baby teeth, most causes are behavioral. If you notice your child's teeth are chipped, you may also notice she grinds her teeth at night or chews on hard surfaces. If her teeth are rotting easily, you may find she sleeps with food in her mouth. If a tooth is prematurely loose, you may have been distracted by the scrapes and bruises incurred when she fell the other day and neglected to notice she knocked a tooth loose. You should also note not all tooth discolorations point to a disorder. White spots, for instance, are likely the result of too much fluoride, which is commonly found in public water sources. The Better Health Channel, a service of the state government of Victoria, Australia, reports these spots are harmless and do not result in weak teeth. To effectively treat a dental disorder you should consult a dentist. The dentist may choose to fill teeth, place sealants or suggest lifestyle changes. Whatever the course of action, your dentist will likely do everything he can to save your child's teeth. If you believe your child has weak baby teeth, preventing further problems is crucial to saving his teeth. While genetic disorders are unpreventable and typically unforeseeable, you can take steps to prevent chipped teeth, decay and loss of teeth. Prevent your child from using his teeth as a tool and offer softer options to gnaw on if your child is still teething. To prevent decay, teach your child proper brushing techniques and ensure that brushing occurs several times a day. It is also important to prevent your child from sleeping with milk, juice or food in his mouth. Dentists can also place sealants or caps to prevent further decay of weak baby teeth. If your child has an abnormal loose tooth, leave the tooth alone and take your kid to the dentist as soon as possible, as she can fully assess the damage and easily keep the tooth in place.